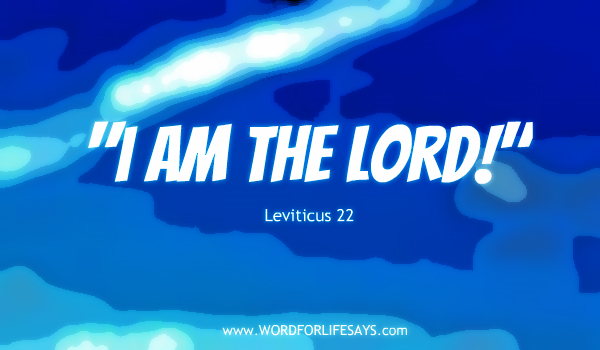 Reading in Leviticus this morning, particularly chapter 22, in the midst of what seems to be a bunch of rules, regulations and requirements for offering, these four words kept jumping out at me: I AM THE LORD. As a matter of fact, these words appear in this exact order seven times in in this one chapter alone. As a matter of fact, these four words appear throughout this entire book, not just chapter 22, many, many more times. The gist of it all is what I think most, even in our modern churches and lives forget about, everything we do we do for the Lord. Our lives; our worship are not our own. We are to be dedicated to Him and give Him what is due His holy name. When we come before Him we are to have a devoted mindset and a devoted heart. Our worship is to be as pure as any sacrifice that was offered unblemished before the Lord in the Old Testament. Our lives are to be pure and open vessels ready to receive of His Spirit in us and ready to pour out of His blessings into the lives of others. What are we really giving to God on a daily basis? What are we really offering to Him in our times of worship? God wants the best of us! He wants holy lives that recognize and live for Him because of who He is: the LORD! He is God the Author and Creator of the universe and beyond. He is as supreme as supreme can get and He deserves to be reverenced as such. “But as he which hath called you is holy, so be ye holy in all manner of conversation; because it is written, Be ye holy; for I am holy,” (1 Peter 1:15-16). Other parts of Leviticus tells us, “Sanctify yourselves therefore, and be ye holy: for I am the LORD your God,” (20:7). God wants holiness in our lives and in our worship. I love a message that pronounces blessings just as much as the next person, but without holiness, it means absolutely nothing in His sight. As a whole we need to come back to the central theme of holiness because the LORD requires nothing less. I am not talking about rules and regulations, but rather hearts fully dedicated to Him because they recognize that He is the LORD and they want to give Him the best of themselves. And, that’s a holy life. We must never lose sight of, diminish, or bring down to our level the glory and honor He deserves. He is the LORD! He is Sovereign over all! He is Master! He is Savior! He is King! “I AM THE LORD!” he exclaimed, and holiness before Him is what He desires. Pingback: “Give God Your Best!” Sunday School Lesson, Leviticus 22:17-25, 31-33, December 13, 2015 | Word For Life Says . . .
amen so true every thing we do we should be doing it for the Lord. thank you for giving us the word of God. Yes, indeed! He is to be our priority. Thank you for stopping by and commenting. Blessings to you!